The 2020 European Championship qualifiers start this week. 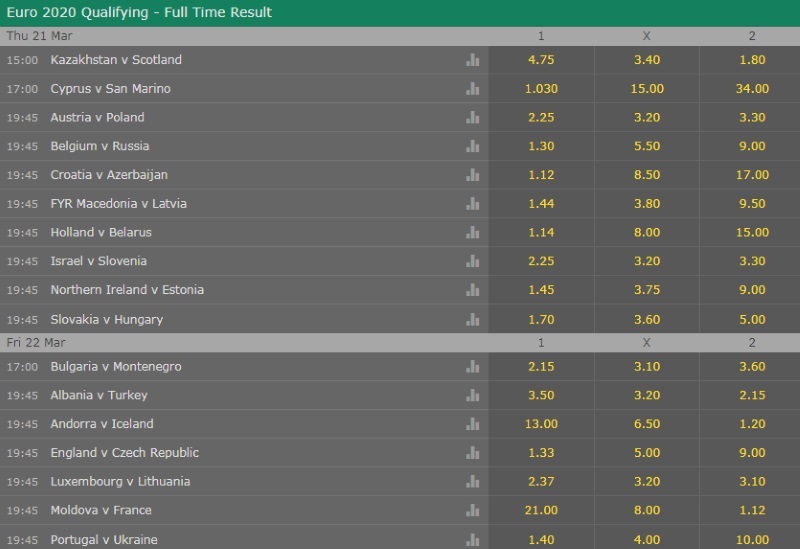 We have a range of fans from different nationalities that post on here so check out the odds of your nation's games and let us know what we should be betting on in these matches! Football Facts and Streaks regarding Euro 2020 Qual. Slovenia has under 2.5 goals in their last 4 games. Israel won their last 3 home games. Belgium scored in last 18 home games. The 2020 European Championship qualifiers start today and we have an early kick-off out in the Astana Arena in Astana where Kazakhstan host Scotland in a 3pm kick-off. It's vital for Alex McLeish's side to get all three points here in a group that also includes Russia, Belgium, Cyprus, and San Marino. Kazakhstan have built up a run of form thanks to their UEFA Nations League participation. It's now just 1 defeat in their last 6 matches for Michal Bilek's side. OK, so they've only played the likes of Andorra, Latvia, and Moldova but it's bound to have done their confidence the world of good. Scotland will be bouncing after qualifying for League B after getting promoted from their League C group in the UEFA Nations League. It's a turn around in fortunes for a side that looked gone under Gordon Strachan. The 4-0 win away to Albania in their last away competitive game will give them a boost needed to head into this game. I'm backing Scotland to get the job done here. It might not be pretty but I can see them winning 2-1 or 1-0. I'm not entirely convinced they'll win by more than the odd goal but who knows. Kazakhstan is a hell of a place to go and any kind of win can be considered a good one. @jazzman02, @real55555, @hristofor, @Peter_Portman, @Podosfairistis, @Niceguy, @markus808, @Feduloff, @clubgowi, @Neubs, @Hunter12, @salmonman, @JuMeSyn, @recklessrookie, @janesill, @Mustionown, @potus, @kevinjoh, @dinero, @Hutcho_CFC, @roveruk, @matrixman, @Jazzer Isaac, @Dylan Lynch, @Tiffy, @Kenton Schweppes, @MangoTheThird, @neilovan, @mcsilks, @Ameer, @thfc, @Roy The Boy, @Tim81, @sajtion, @newjack, @Gedkip, @Mindfulness, @Magic0024, @mijOsim, @canaries91, @waynecoyne, @allyhibs, @four-leaf, @Icongene, @malabgd, @Stevecw, @Xcout, @Teodore, @Bobby Vegas, @Darran, @DrO, @mtom, @KikoCy, @betcatalog, @immortal--, @allthethings, @DW_United, @Pipoca, @liamcorrigan86, @vasilli07, @Misa, @Pep004, @rOYS123, @thinkpink63, and @Marek76, what bets are you all looking at for these games? I think that the odds should be more equal here. OK, Slovenia disappointed in Nations League where they didn't win a match and relegated in Division D. But in a lot of these games they played with mixed squad without some of their best players. In the last European qualifiers finished in 3rd place and played playoffs where they were defeated by Ukraine. Israel are very unpredictable at home to be a favourites, lost their last 3 official games, 2 of these losses was against North Macedonia and Albania, teams that aren't stronger than their current opponent. Slovakia are very strong upfront their crowd, they won 8 from last 10 home matches, lost only 1 of them. Hungary are poor as guests, they lost 6 from their last 8 visits, some of these losses were really shocking like 0-1 from Andorra and 1-2 from Luxembourg. Slovakia should easily win this match, so home win i guess. The huge time zone difference of 6 hours. Despite the strategy the management of the Scotland national team has devised, it won't be easy for the players to perform at their optimal level. Key players missing the game due to injury, retirement or precaution. The game will be played on artificial grass. Despite being in the bottom section of European football, Kazakhstan are not easy to beat at their ground. They made a coaching change earlier this year which may bring temporary momentum into their players. A flutter on the draw at average odds of 23/10 may be worth it. You're welcome to contribute, but we can't allow new users links as it's considered spam unless authorised. I’m going to be absolutely insane here and say that Estonia might be able to take something from Northern Ireland. They lost their last game at home to Austria 2-1 and lost two away games to Austria and Bosnia before that, with a 0-0 draw to the Republic of Ireland sandwiched in between. Their squad is aging and there’s bound to be some complacency in this one. Estonia are ranked 98th in the world but a 0-0 away draw with Iceland after a 2-1 win away to Finland is going to boost their confidence. They were both friendlies but they did win their last competitive away game, although admittedly thanks to a Greek own goal. Theyre going to play for a smash and grab and if Northern Ireland think this ones already in the bag then it might just work. I've been holding off posting until the team was announced. The way to approach this game is to attack and that's what Scotland have been set up to do, with players like Mcgregor, McGinn, Forrest, Armstrong we should really be winning this. At odds of 2.00 or thereabouts I'm all over the away win. Group C kicks off tonight with Northern Ireland taking on Estonia at Windsor Park in Belfast in a 7:45pm kick-off. Both sides will be looking to take all three points here if they are to have a realistic chance at reaching the 2020 European Championship with the other teams in the group consisting of Netherlands, Germany, and Belarus. Northern Ireland are in a bit of a slump right now. Michael O'Neill's team are without a win in four international matches. The Green and White Army have only managed to score one goal during that time as well. Austria (twice), Bosnia and Herzegovina, and Republic of Ireland are four matches they'd arguably have hoped to get more from. Estonia reached the 2012 European Championship qualification play-offs but that's been there only real brush with success on the international stage. Martin Reim's men will simply be trying to be competitive in this group and avoiding finishing bottom would be a positive. They are unbeaten in their last three games including wins over Greece and Finland. I've always felt Northern Ireland under O'Neill were a tough team to beat. My own Wales struggled to dispose of them at the 2016 European Championship in the 2nd Round. I feel at home they are a match for anyone and should win a tight game here. Estonia are themselves a tricky side to break but I can see a 1-0 home win here. Bulgaria has under 2.5 goals in their last 3 games. Turkey allowed opponents to score over 1.5 goals in last 3 games. Lithuania has over 2.5 goals in their last 4 games. Well, I certainly didn't see that one coming, Ally! The players we have should not be losing like that. One word - McLeish. The Scotland tipping ruined my 5 fold and cost me a payout of 2.1K, that's without the Scot result. Devastating. Only one person to blame... Alex McLeish! Scotland should be winning games like that with their talent pool. I am backing Sweden to finish in the top two of their group at 1.90. The clear favorite for the first place in this group is Spain, leaving Sweden, Norway and Romania to battle it out for the second place. Based on recent performances, Sweden are clearly the best team of that bunch. They are quarterfinalists from the most recent World Cup last year. They also won their group in the Nations League, manhandling Russia comfortably, which themselves played in a World Cup quarterfinal. Norway and Romania played lower quality of football over the autumn, and they were a part of the weaker Division C in the Nations League. The Norwegians in particular have a guaranteed playoff spot, so they are expected to play a little more carelessly so to speak, as they know they will have a second chance to qualify for the UEFA Euro 2020 Championships final stage. Matchday 1 this week sees Sweden play at home to Romania and Norway play away to the Spaniards. Assuming the Norwegians will lose that game, if Sweden manage to beat Romania at home, they will put a firm hand on that top two finish from the beginning. I expect these odds of 1.90 to decrease after the first round of fixtures, so that price is good value before the qualifying competition gets underway. Iceland have gone a full year without a win, having played 15 games in the process (6 draws and 9 defeats). They are really struggling and will be expected to turn their fortunes against one of the football “minnows” in Europe. However, Andorra aren’t taking it easy at home lately, drawing all their three home games in the Nations League. In the last World Cup qualifying cycle they even managed to beat Hungary. Hence, it’s highly likely that if Iceland fail to score early in the game, they may feel the pressure of needing to win at all costs which can backfire. In addition, bookmakers expect a low-scoring game. I’ll proceed with a wager on Andorra (+2) Handicap Result at odds of 2.00 (Evens), meaning Andorra mustn't lose the game with more than one goal. I think the Albanians are underestimated in this group compared to Iceland and Turkey. I am taking a punt on Albania to finish top two of their group at odds of 15.0, and will also try 1 DNB today vs Turkey at odds of 2.62, both with small stakes. Group A in the 2020 European Championship qualifiers gets started tonight with UEFA Nations League finalists and 2018 World Cup Semi-Finalists England taking on Czech Republic in a 7:45pm kick-off at Wembley. Surely, a home win is the banker here, right? England have exceeded expectations under the tenure of manager Gareth Southgate. The former England defender has led his country to the last four of a major tournament and put them within touching distance of winning the UEFA Nations League. Where's the knighthood?! This is even before we entertain the way he's brought the youngsters through. Czech Republic were once a force to be reckoned with in European football but gone are the days of Pavel Nedved, Tomas Rosicky, and Jan Koller. The nation still has a number of talents such as Theodor Gebre Selassie, Borek Dockal, and Matej Vydra. They are also a nation that loves the European Championship having qualified for every edition since transforming from Czechoslovakia in 1992. They've reached the Semi-Finals twice in 1996 and 2004. This match is a chance for England to start on a win. The Three Lions have the insurance of knowing they are guaranteed at least a play-off spot thanks to their UEFA Nations League performance. That means they can afford to finish 3rd and still make the play-offs. I know Southgate will demand a top spot finish and with the other teams in their group being Bulgaria, Montenegro, and Kosovo I can see them doing that. A clean sheet win for them here I believe. i think england will concede and i will have to come back from goal behind to win. Italy has under 2.5 goals in their last 4 games. Finland has under 2.5 goals in their last 7 games. Italy allowed opponents to score over 1.5 goals in last 4 home games.